WHAT USES DOES CLASS B1 COVER? 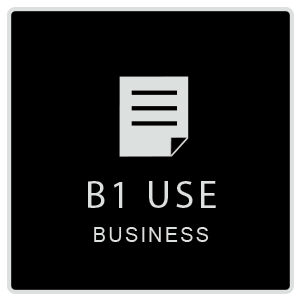 The B1 Use Class covers business such as offices, although this excludes those that come under A2. Class B1 also covers premises for the research and development of products and processes, and light industry that is appropriate to a residential area. [Sui Generis is the name given to uses which do not come under any other use class. These include: betting shops, pay-day loan shops, theatres, larger HMOs, hostels which do not provide care, scrap yards, filling stations, car showrooms, retail warehouse clubs, nightclubs, launderettes, mini-cab services, amusement centres and casinos.] These three business use classes cover most business use. For a full list of use classes, see the planning portal table. This was a very recent Class B1 project where the client had used another architect for planning permission, then came to us for interior design. The client needed full planning permission because they wanted exterior changes to their building such as new windows etcetera. The property was a commercial building in Kensington, and the brief was to create 15 office units for external businesses to rent. Our brief was to prepare an interior design and a brand identity for the office spaces within the existing internal spaces in the building. We tackled this via optimizing the internal syntax and arrangement of spaces in liaison with the other architect to meet the client’s requirement of having a serviced office. We advised the other architect about the selection of materials, and obtained competitive quotes for them. The other architect created designs for the exterior, and also the interior layout. However, in the creation of our interior design scheme, we proposed modifications to improve the layout in terms of functionality and flow of movement within the space. We created two different interior schemes for the reception space, meeting rooms, 15 obscure glazed office rooms with work stations, communal spaces such as kitchen, toilets and seating areas. One scheme was high end and the other was medium end, in terms of luxury and cost of finishes. As mentioned, we liaised with the other architect regarding the internal layout, and also created fit-out & furniture designs and plans where appropriate. We also created a schedule and price list for FF&E (Furniture, Fittings & Equipment) to meet the client brief and the requirements of the other architect. We delivered conceptual mood-boards and floor plans, a sample board to indicate furniture and finishes, sketch visuals for each space. Once these were signed off, we delivered the scaled arrangement plans for the layout, FF&E, internal elevations, joinery package, low level electrics / power plan and finishes plan. We also provided specifications for the finishes, FF&E. Next we supplied 2 working progress 3D renders and 1 photorealistic render for each space, as well as final samples for soft furnishings and materials such as marble and glass. For the branding, we were to harmonise the look of the new offices to match each other and also the existing host interior. This was partly achieved by our selection of matching artefacts and accessories. We proposed graphics products in keeping with the new brand, e.g. a web wireframe design, an e-newsletter design and stationery design. As you will see in the images below, the client wanted exclusive, bespoke interiors that were not only opulent but would create an environment with quiet spaces to work. We aimed to promote an atmosphere which soothing and not distracting, and we achieved this via natural materials, subtle colour blends and a separate lighting design to create a pleasing ambience within both the entire and individual interior spaces. The designs were completed and signed off in October 2017, and due to the luxurious finishes, they should take several months to install. We assisted them for the construction phase via reviewing of contractors’ documents, co-ordination of FF&E, providing samples and alternatives for the furniture and fit-out, fortnightly site visits.